Professor Burton Hatlen, a highly distinguished member of our faculty and a noted scholar, received his original training in Renaissance and 17th Century non-dramatic literature, but later broadened his scholarly horizons to include modernist and post-modernist poetry. In addition to his teaching and writing commitments, Professor Hatlen, who was himself a published poet, served as Director of the National Poetry Foundation, as Editor of the journal Sagetrieb, and as Assistant Managing Editor of the journal Paideuma. 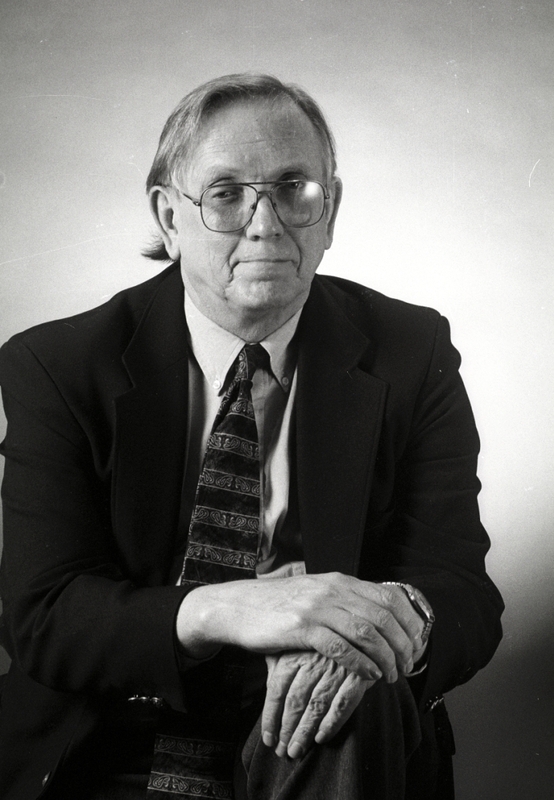 Professor Hatlen was the 1996 recipient of the University of Maine Presidential Research and Creative Achievement Award. Prof. Hatlen passed away on January 21, 2008. The Hatlen Seminar Room was created in his honor and dedicated in December, 2008. B.A., University of California, Berkeley, l958. Ph.D., University of California, Davis, l973. Acting Associate Professor of English, King College, Bristol, Tennessee, l96l-2. Instructor in English, University of Cincinnati, l962-5. Assistant Professor of English, University of Maine, l967-l972. Associate Professor of English, University of Maine, l972-l98l. Professor of English, University of Maine, l98l-2008. Chair, Department of English, University of Maine, l985-1988. Fulbright Senior Lecturer in American Studies and American Literature, University of Bergen, Bergen, Norway, 1988-1989. Director, National Poetry Foundation, 1990-2008. Interim Dean, College of Arts and Humanities, University of Maine, 1996-7. “Oppen and the Unspeakable.” Forthcoming in Sagetrieb. “Pound’s Cantos and the Epic Mode in American Poetry, 1915-1931.” Paideuma. 34.2&3 (Fall and Winter 2005): 231-270. Special issue edited by Hugh Witemeyer. 5,000 word essays on “George Oppen” and “Muriel Rukeyser.” Greenwood Encyclopedia of 20th Century American Poetry. Ed. By Jeffrey Gray et. al. Westport, CT: Greenwood Press, 2006.Vol. 4, pp. 1181-1186 and 1399-1403. “The Eroding Foundations of American Imperialism,” 15,000-word essay, published in the on-line journal Public Resistance 2.1 (Fall 2006). Essays on “Racism and Anti-Semitism,” on “Paideuma” (p. 211), and on “Terrell, Carroll E.” The Ezra Pound Encyclopedia. Ed. by Demetres P. Tryphonopoulos and Stephen J. Adams. Westport, CT: Greenwood Press, 2005, pp. 251-254, 211, and 283-4. “Preface” to Collected Poems of Evelyn Scott. Ed. By Carolyn Maun. Orono, ME: National Poetry Foundation, 2005. xviv-xxvii. “Pullman’s His Dark Materials as a Challenge to the Fantasies of J.R.R. Tolkien and C.S. Lewis, with an Epilogue on Pullman’s Neo-Romantic Reading of Paradise Lost.” In His Dark Materials Illuminated: Critical Essays on Philip Pullman’s Trilogy.” Ed. by Millicent Lenz and Carole Scott. Detroit: Wayne State University Press, 2005. 75-94. “Wallace Stevens’s Revisions of the Romantic Sublime.” Wallace Stevens Journal 29.1 (Spring 2005): 131-141. “Foreword: 20th Century American Poetry: Some Guideposts.” The Facts on File Companion to 20th-Century American Poetry. Ed. By Burt Kimmelman. New York: Facts on File, 2005. vi-xiii. “The Rhetoric of the ‘War on Terrorism. '” The Maine Scholar. Special Issue on Peace and War. Vol. 16 (Winter 2004): 119-142. “The Long Poem.” Oxford Encyclopedia of American Literature. Ed. Jay Parini. Vol. 2. New York: Oxford University Press, 2004. 489-509. “Pound and/or Benjamin.” Pound and Referentiality, edited by Helene Aji. Paris, France: Presses Universitaires de Paris Sorbonne, 2004. 69-82. “From the Transcendental to the Immanent Sublime: The Poetry of William Carlos Williams, 1913-1917.” Paideuma 32.1,2, &3. (Spring, Fall, and Winter 2003: 123-155. “Raymond Williams, Ezra Pound, and the Heritage of John Ruskin.” Key Words: A Journal of Cultural Materialism 4 (2003): 131-151. Ezra Pound International Conference, Venice, Italy, June 26-30, 2007. “‘Primary Wonder’: The Visionary Art of Morris Graves and Denise Levertov.” Modern Language Association Annual Convention, Philadelphia, PA, December 27-30, 2006. “The Projectivist Poetics of H.D.’s Trilogy.” Modernist Studies Association Conference. University of Tulsa, Tulsa, Oklahoma. October 19-22, 2006. “Mysticism, Spiritualism, Gnosticism, Neoplatonism, Hermeticism, Theosophy, and/or the Occult: Some Terminological Distinctions.” Modernist Studies Association Conference. University of Tulsa, Tulsa, Oklahoma. October 19-22, 2006. “Ezra Pound and the Emergence of a Post-War Poetic Avant-Garde.” Modern Language Association Annual Convention, Washington, D.C. December 27-30, 2005. “Pound and the Language of Apocalypse.” 21st International Ezra Pound Conference. Rapallo, Italy, July 3-8, 2005. “Pound and the Adams Family.” 16th Annual Conference of the American Literature Association. Boston, MA. May 26-29, 2005. “Ezra Pound and the Silent Film Aesthetic.” Ezra Pound and Education. Hamilton College and Colgate University, April 28-May 1, 2005. “Adapting an Avant-Garde Poetics to the American Scene: William Carlos Williams in the 1930s.” Modern Language Association Annual Convention, Philadelphia, December 27-30, 2004. “Pound’s Philadelphia, Philadelphia’s Pound: Some Sociological Speculations.” Modern Language Association Annual Convention, Philadelphia, December 27-30, 2004. “‘Thoughts of isolate, beautiful being’: A Poetics and Thematics of 55 Poems.” Zukofsky/100. The Louis Zukofsky Centennial Conference. New York, Columbia University, October 21-24, 2004. “Marianne Moore and the Poetics of the Immanent Sublime.” Modernist Studies Association Conference. Vancouver, British Columbia. October 21-24, 2004. “‘My Earthly City Is Reveald in its Beauty’: Robert Duncan in the 1940s.” National Poetry Foundation Conference on Poetries of the 1940s, American and International. Orono, ME. June 23-27, 2004. “From the Transcendental to the Immanent Sublime: A Reading of Wallace Stevens’s ‘Esthétique du Mal. '” Wallace Stevens Conference, University of Connecticut, Storrs, CT. April 8-10, 2004. “Oppen and the Unspeakable.” Annual George Oppen Memorial Lecture. San Francisco, Calif. November 6, 2003.